As the tide of frothing-at-the-mouth anti-health-care-reform whack-jobs begins to recede a bit, many of us in the not-entirely-irrational community find ourselves asking questions that are, in one way or another, versions of "What the hell was that?" How, after all, could so many people have so much passionate intensity about a reform bill about which they clearly know next to nothing? The answer, I think, lies less in the realm of ordinary political analysis, and more in the realm of anthropology. To get a sense of how the kind of mass hysteria we've seen at dozens of town-hall meetings can be conjured into existence, we need look no farther than Claude Lévi-Strauss' classic Structural Anthropology — specifically, the passage in which he explains the function of shamanism in tribal cultures. In a universe which it strives to understand but whose dynamics it cannot fully control, normal thought continually seeks the meaning of things which refuse to reveal their significance. So-called pathological thought, on the other hand, overflows with emotional interpretations and overtones, in order to supplement an otherwise deficient reality….We might borrow from linguistics and say that so-called normal thought always suffers from a deficit of meaning, whereas so-called pathological thought (in at least some of its manifestations) disposes of a plethora of meaning. Through collective participation in shamanistic curing, a balance is established between these two complementary situations. So, when we're thinking "normally," we face a world in which there's a surplus of phenomena and a lack of understood significance. We see things, we don't quite understand how they work or what explains them, and we try to fill in the blanks. We try to figure things out, and spread light into those obscure and darkened corners of the map labeled "here dragons be." When, however, we're thinking "pathologically," things go differently. We begin with a surplus of emotions — fear, say, or anger, or aggrievement — and we look for something to which we can attach those emotions. One of the more important functions of the tribal shaman, for Lévi-Strauss, is to offer an explanation of the world that A) satisfies our "normal thought" desire for an understanding of how things work, and B) that takes our free-floating "pathological thought" emotions and attaches them to a definite object. If you're thinking this sounds a lot like the finding of scapegoats, you're on to something. Consider the situation in Germany leading up to the Second World War: a defeated and impoverished people wanted to know how they fell so low (a "normal thought" desire for an explanation); at the same time they harbored a lot of anger, resentment, and fear, the proper causes of which were complex and difficult to locate. A talented but completely unscrupulous and immoral group of politicians could go far by offering both an explanation for German defeat, and group of people upon whom to focus anger and fear. Of course those politicians did go far, coming to power while blaming Communists, Jews, Gypsies, and others for the state of affairs. That this explanation wasn't valid wasn't really relevant: it allowed people, as long as they didn't think too hard, to satisfy the desire for an explanation of things (normal thought), and it allowed them to project their anger and fear on conveniently vulnerable scapegoats (pathological thought). The propagandists of the new regime were, in effect, performing a particularly evil version of the shaman function. That they performed this shamanic function with modern media and technology contributes to the particularly uncanny combination of the technological and the atavistic that was so characteristic of the horrors of the holocaust (as Martin Amis so memorably put it, the German political powers “found the core of the reptile brain, and built an Autobahn that went there"). While the current situation differs greatly in scale and in general evilness from the German example, both represent moments when the shamanistic function comes to the fore in modern politics. I mean, think about it: there's an awful lot of free-floating anxiety out there now, in post-9/11, post-economic meltdown America, especially among some Republican constituencies, who until recently have had a harder time finding a focus for their negative emotions than Democrats have had. (The issue for Dems is easy: Bush is the bad guy. Focus of negative emotions found, explanaiton of our woes located). Where are people who don't want to blame Bush & Co. to locate their negative emotions? How are they to explain the sad state of affairs in our country? The G.O.P., and their allies in the insurance corporations, have some very sharp people handling their publicity, and they seem to have made a deliberate decision to direct people's anxieties toward a particular objects: the federal government and the idea of socialism in connection with health care. Both the federal government and socialism seem remote to most Republicans (familiarity with someone or something makes it harder to turn that person or thing into a scapegoat), and both come pre-equipped with negative connotations, connotations manufactured or magnified by decades of public relations efforts. "Why do you feel uneasy? Why are you afraid?" ask the shamans of the G.O.P. "Because the socialists and the federal government have been out to get you! And before you know it they'll haul you before a death panel!" The fact that this is false doesn't rate: it's satisfying to both the normal and the pathological thought-processes. It doesn't have to be true: it works. Or so you might think if you're unscrupulous, and don't mind the fact that millions of people in this country go uninsured. Frank Luntz, for my money the most powerful Republican shaman (or, in more conventional terms, "political consultant") is the great architect of this strategy. He's quite bright, and his book Words that Work: It's Not What You Say, It's What People Hear is depressingly on-point most of the time. He's the one who said, of the idea of expanding access to health care, "we have to turn this into a government takeover." It's his strategy that we see when those red-face, screaming people pop up at town-hall meetings. They're angry, they're afraid, they're insecure. And, ironically, their insecurities have been quite successfully attached to a reform bill that would, objectively, make them a hell of a lot less economically and medically insecure. I wish I knew what to do about this, but really, I'm pessimistic. After all, we live in a country where scapegoating has a tradition going back to the Salem witch trials, and that in modern times has manifested in the Palmer Raids, the House Un-American Activities Committee, Reagan's talk of welfare queens, Lou Dobbs' anti-immigrant screeds, and the big scare around gay marriage. It's hard to fight this sort of thing with reason and evidence, since so much of what's involved is pathological rather than rational. And, perhaps foolishly, one hesitates to put on face-paint pick up the shamanistic rattles and snake-charms and work shamanistic strategies for one's own side. 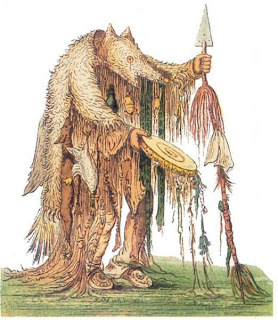 I mean, most of us just don't look good in wolfskin robes and ancestral totem masks. In other news, the good people at Poetry are running a bit of a debate about my piece on the (temporary) obsolescence of the manifesto in the back pages of the current issue, with contributions by Henry Gould, Ange Mlinko, Michael Marcinkowski, as well as my own weak and fumbling response.